by Ed Raarup. Illustrated by Lindsay Nery. 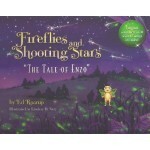 Fireflies and Shooting Stars is a delightful and inspirational tale filled with beautiful art and songs about Enzo, a little firefly who was born without a taillight. As Enzo faces the challenges of growing up different, the story tells of his self-determined, fantastic journey and adventures to find his light—a magical ride of hope, understanding, and discovering the importance of accepting the differences in others as well as ourselves.